3. Since therefore the life and labors of the priest belong wholly to the sphere of Faith and to the kingdom of grace, he is entirely dependent upon the Holy Ghost, and step by step in need of His supernatural assistance. In order to fulfill his sublime calling worthily (Eph. 4:1), and to carry on his sacred ministry so as to merit the blessing of God, he must be replenished with the Holy Ghost (repletus Spiritu Sancto, Acts 4:8) and be full of the Holy Ghost (plenus Spiritu Sancto, Acts 11:24), and in all his actions be led and moved by the Spirit of God (Gal. 5:18; Rom. 8:14), that is, by a prompt, resolute obedience to the light and the inspirations of the Holy Ghost he must lead a truly spiritual life. This supernatural living, working, suffering, and praying in the Holy Spirit (1 Cor. 12:2) presupposes humble submission to the authority of the Holy Ghost, as well as perfect union and constant intimacy with the Holy Spirit, that is, tendering profound homage to the Third Person of the Blessed Trinity, by adoring Him in the spirit of faith, invoking Him with unbounded trust, and offering Him heartfelt gratitude and love. Brevity and compactness joined with inexhaustible content, pleasing simplicity and transparency with depth of thought, and vivacity of sentiment, appropriate figures of speech with surprising analogies and antitheses these are the excellences our Pentecostal Hymn portrays, ranking it among the most fragrant blossoms in the garden of holy poesy. There is perfect harmony between its attractive content and the melodious sweetness of language in which it is expressed. The activity of the Holy Ghost in the souls of the faithful is here pre-eminently envisioned in His capacity as our “Helper” and “Comforter” in sorrow and strife, in danger and death. But this strain always seizes mightily upon the inner strings of the restless, tormented human heart, and therefore finds here its truest and most natural expression in calling from the “abyss” of its poverty and misery unto the abyss of divine compassion. (Abyssus abyssum invocat Ps. 41:8). 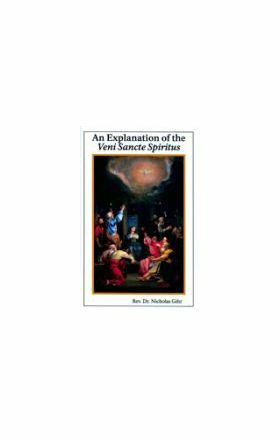 This explains the peculiar character of the Pentecost sequence, which contains neither a delineation of supernatural facts, nor formal praises, but only humble invocations to the Holy Ghost.